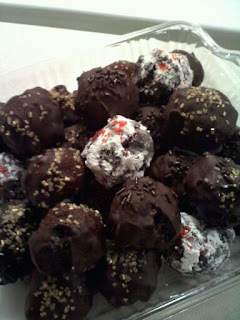 I have recently discovered some magical things, one being peppermint truffles. I have seen all these recipes calling for various cookies mixed with cream cheese, rolled, and dipped in chocolate. 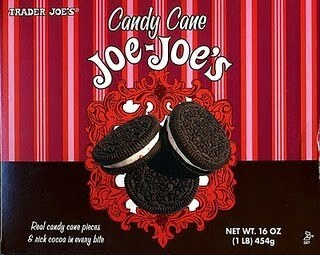 Well, I can do that I said to myself, I can do that with CANDY CANE JOE JOE'S! Best idea ever, really.. 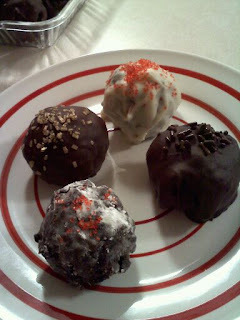 It's super easy, go to Trader Joe's today, get the things you need to make these babies, and do it TODAY! Spray a baking sheet with cooking spray or line with wax paper and set aside. In a large bowl combine cookie crumbs and cream cheese, mix well until all combined thoroughly. Wash your hands, put on some gloves, whatever you want to do and roll into 1 inch balls. Chill balls about 30 minutes. Melt chocolate, I just put the chips in a microwave safe bowl and heat about 2 minutes then stir until the chocolate is in it's melty glory. Dip the balls. I use two forks, toss the ball around, tap off excess chocolate, place on baking sheet. Once that is all done, decorate as desired. You can also roll the cookie balls in powdered sugar. I did that to some of them and people really enjoyed it. Put back in fridge until firm, about an hour or so.